The first part of an email that Twitch sent out to all their users. Twitch answered my questions about whether copyrighted music is allowed on live streams in a recent email/blog post. Twitch recently did a restructuring of their website. This included Twitch’s precursor website Justin.tv. Justin.tv has been removed and Twitch is now focusing on their more profitable product, Twitch.tv. They’re also attempting to make Twitch more profitable by reducing the amount of storage space they’re using for the website. Previously, a streamer like me could store ALL their past broadcasts on Twitch. Not many people watch those and it requires Twitch to have a lot of hard drive space to store them. With the benefit of this infinite storage being next to nothing for Twitch, they’re removing that service. Past broadcasts are now saved for about a week. That week allows a streamer to cut out the best portions as highlights to save forever. The removal of Justin.tv and the extra storage space both sound like smart ideas to me. Twitch saves money and the majority of their users don’t care. The audio protection also makes sense, but a lot of people are upset about it. Audible Magic is a service that identifies copyrighted music and flags it for Twitch. Flagged videos then have the 30 minute section around that copyrighted portion muted. That seems excessive to me for what could’ve been a 30 second clip of music, but whatever. But that’s only for videos, the past broadcasts that Twitch is removing and highlights that might contain copyrighted material. Audible Magic will not be screening live streams on Twitch for copyrighted material, so thousands of streamers can still get away with playing copyrighted music in live streams. I’d prefer not to do that. If I really want my Twitch channel to succeed in a big way I cannot break the law to do so. 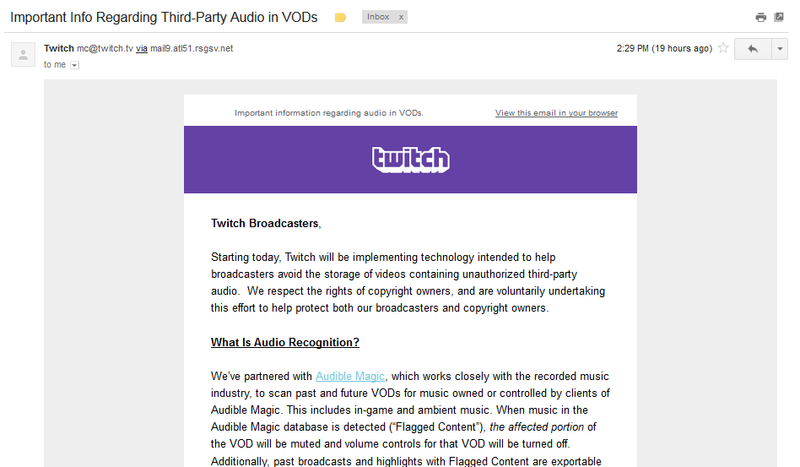 Twitch has made it clear, playing copyrighted music without permission to do so is not okay. A lot of high profile streamers use public domain music, so that’s where I’ll be going next. There’s a lot of places to look for music I can use. If anybody has any suggestions, feel free to let me know!